It's a Wonderful Life is undisputed as one of the best Christmas films ever, as well as possibly one of the greatest films in cinematic history, so taking this much loved family favourite and giving it the Tim Burton treatment is understandably risky, until you delve beneath the hype and acclaim and realise that It's A Wonderful Life is practically a Burton film anyway. A Christmas film that starts with Angels of differing ranks talking about saving a man hell bent on suicide? Sounds like a Burton Christmas already doesn't it? 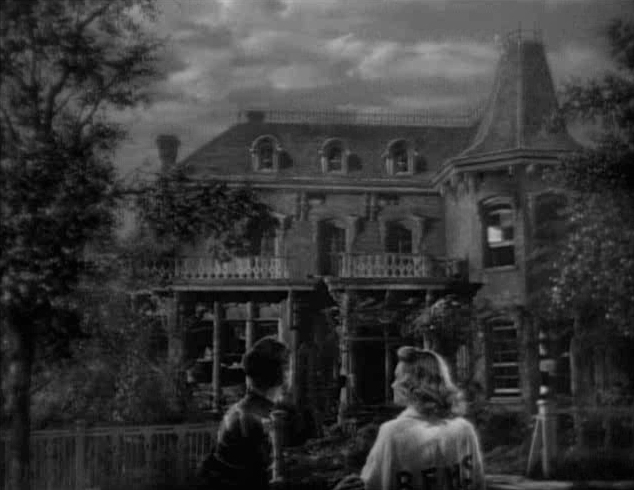 And even the look of the film has Burton elements. The abandoned house that George and Mary throw stones at is Edward Scissorhands palatial abode if ever I saw it, in black and white the film has a dark tone and Bedford Falls has a Gotham feel, and in colour the faded green and brown aesthetic is just crying out for some Johnny Depp zaniness. So to Burtonise It's A Wonderful Life just needs a couple of small tweaks. The Angels at the beginning, rather than being talking constellations of stars, become nightmarish puppets voiced by Martin Landau, Jack Palance and Micheal Keaton as the trainee angel without his wings that will appear later in the film. The story itself runs for the most part as it is, with the exception that the Loan company becomes a doll shop as creepy dolls are the currency of the future. Older George Bailey is played by Johnny Depp with same "boy will I!" manic 40's radio presenter feel that he brought to Ed Wood with younger brother Harry being played by Ryan Gosling. Father Bailey is of course a heavily prosthetic covered Brad Pitt. Evil ventriloquist Potter, Bill Murray for sure, wants to take control of the Bailey doll shop but is thwarted at every turn by the reluctant George, who despite wanting to flee Bedford Falls stays and marries Mary, Helena Bonham-Carter (who else?). Eventually the forever put on doll maker has no option but take his own life but is rescued by trainee angel Michael Keaton, looking like he just walked out of an Austin Powers fancy dress party. The rest you know. Depp and HBC live happily ever after, Gosling never needs a sew a button on a puppet and Bill Murray despite his best efforts ends up having to remake Zombieland. Add in a score co-produced by Danny Elfman and Eminem?